Venice’s former Jewish ghetto (Campo del Ghetto Nuovo) is one of the most fascinating and poignant corners of the Floating City. The oldest Jewish ghetto in Italy is home to a number of 16th-century synagogues, the Jewish Museum, a small Holocaust memorial, and kosher restaurants and bakeries. The origins of the word ghetto can be traced back to Venice: gheto in Venetian means foundry and refers to the island where Venetian Jews were once confined after sunset by Venetian Republic decree. The area is divided into the Ghetto Nuovo (New Ghetto), and the adjacent Ghetto Vecchio (Old Ghetto), though the Ghetto Nuovo is actually the older of the two. Jews from across Europe settled in this neighborhood from the 16th to the 18th centuries, and each synagogue historically catered to a different nationality—German, Italian, Spanish, and Sephardic. Today Campo del Ghetto Nuovo is still the center of the Venetian Jewish community and offers a glimpse into its history and culture. The ghetto’s Jewish Museum (Museo Ebraico) narrates local Jewish history with a collection of antique gold objects and textiles from ghetto artisans, historic religious texts and artifacts, and personal and household items from former residents. There is also a small Holocaust memorial in the neighborhood to honor the many residents deported during World War II. Book a Jewish ghetto walking tour with a guide to learn more about the ghetto, or pair your visit with a Cannaregio food tour or home cooking experience to explore local cuisine. The museum offers guided tours of the neighborhood’s historic synagogues, or you can book a private tour to view these historic places of worship more intimately. The Jewish ghetto is a must for those interested in Jewish culture and history. With its narrow streets and quiet square, the ghetto is one of Venice’s most pleasant historic walking areas—and a lovely spot to snap photographs. Jewish ghetto tours are on foot, so be sure to wear comfortable shoes. This area is also known for its excellent traditional kosher restaurants, so it’s a good place to stop for lunch or dinner. The Jewish ghetto is in Venice’s Cannaregio neighborhood. Take the vaporetto (water bus) to the Ponte delle Guglie stop on the Fondamenta di Cannaregio. As one of the main tourist destinations in Europe, Venice can be very crowded most of the year. To avoid the thickest throngs, visit in early spring or late fall. The December Hanukkah festivities in the historic ghetto, with music and celebrations with the traditional lighting of the menorah, make for a particularly beautiful time to visit. The ghetto has five historic synagogues: the Schola Tedesca for the German community; the Schola Spagnola and the Schola Italiana for the Spanish and Italian communities, respectively; the Schola Levantina for the Sephardic community; and the Schola Canton, a private synagogue probably built by French emigrés. Discover Venice’s hidden gems on a 2-hour cruise through the city’s secret canals. Watch scenes of daily Venetian life as you glide through the lesser-known neighborhoods of Cannaregio, Dorsoduro and the Jewish Ghetto. A guide will share insight into the city’s history, architecture and local legends. For a grand finale, head out into the wider waters of the Grand Canal and float beneath the iconic Rialto Bridge. Numbers are limited to nine people on this small-group tour for a more intimate experience. Learn insider secrets of Italian cuisine with a cooking class in a Venetian home, located in the bustling Polo Quarter of Venice. Choose between a lunch and dinner class and get hands-on experience creating traditional Italian dishes with guidance from a passionate chef. Enjoy the meal you've made, complete with wine. Eat and drink your way through one of Venice’s most distinctive neighborhoods on a walking food tour through the Cannaregio district, also known as the former Jewish ghetto. Learn about the area’s rich history and culture from a local guide as you stroll through its narrow winding streets, stopping to sample some of the best and most authentic delicacies around, from traditional kosher dishes and wine to creamy risotto and fresh-baked goods. Buon appetito! See a different side of Venice with this off the beaten path walking tour, including the Jewish Ghetto and Cannaregio. Follow your private guide to these two lesser-known neighborhoods away from the city center crowds. 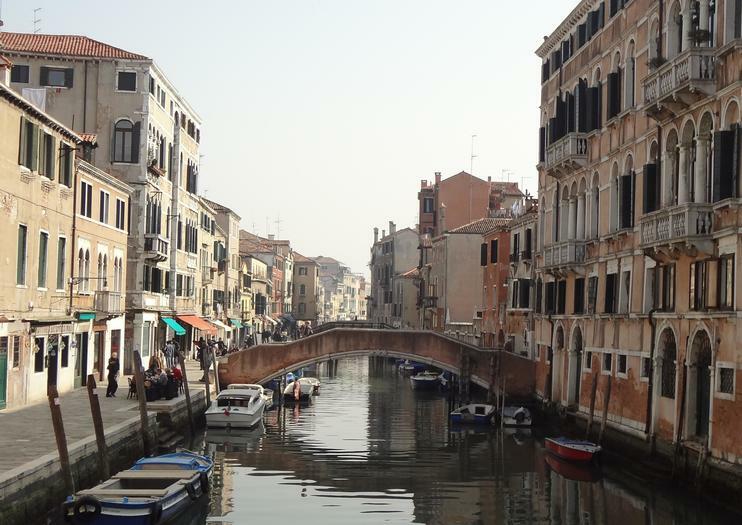 Learn about the area’s history and hear stories about how Venetians live today. This private tour can be customized according to your interests. Cannaregio is one of Venice’s most fascinating districts. Characterised by its long and wide canals, Cannaregio, which in the past was the home of many venetian painters, is still home of lively neighbourhoods.Considered the northern part of the city and the largest and most populated of the Venetian Sestieri, famous for the works of art of its churches and its oldest Jewish Ghetto in Europe.Crossed by the Cannaregio Canal, it's the only one in the historic center together with the Grand Canal which is served by SteamboatsJoin a private tour in the morning or in the afternoon. It's very suggestive! Don't miss it! Most tours only visit Venice’s historic Jewish district in passing, but this specialized guided walk takes you to the heart of Cannaregio and the Jewish Ghetto. Discover hidden corners of the city and little-known palaces and bridges, and listen to an overview of Jewish culture and traditions in Italy. The tour conveniently ends in the neighborhood, so you can opt to visit the museum and synagogue on your own. If you’ve already hit the main sights and are thirsting to uncover another side to the history-packed city, then this Venice walking tour has got you covered. Escape the tourist track and immerse yourself in local culture in the sestiere, or district, of Cannaregio, an off-the-beaten-track neighborhood filled with artisans. You’ll also visit the former Jewish Ghetto as you learn about the city’s overlooked dark chapters. A unique tour created tailor-made for you. Tell me your interests and I will create an experience suitable to your requests. “Against all odds, its Ghetto, founded as a place of segregation in 1516, became a cosmopolitan crossroads of different Jewish communities and an influential place for cultural exchange between Jews and non-Jews. This tour enables both residents and international visitors to live, learn and understand the Jewish community Venice from the past to the present” from Beit Venezia.The tour includes a meeting with the director of the house of Jewish Culture who will present the history of the Ghetto from a new point of view ... we will talk about history, culture, identities and integration.